U.S. Africa Command (AFRICOM) says new information reveals a woman and child were killed last year in a U.S. airstrike in Somalia, the first civilian casualties acknowledged in the U.S. military's war against Islamist militants there. "We follow the law of armed conflict and regret that this incident resulted in the loss of two innocent lives," Olson told reporters in a teleconference. "AFRICOM is committed to transparency, and we have a solemn obligation to … the Somali people we're trying to protect." 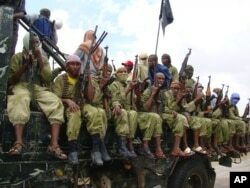 FILE - Al-Shabab fighters sit on a truck as they patrol in Mogadishu, Somalia,Oct. 30, 2009. About a week later, an "AFRICOM subordinate unit conducting counterterrorism operation in Somalia" received new information, Olson said, which prompted the team to open up its investigation. The command strongly rejected the rights group's conclusions in the report. The United States has conducted airstrikes against al-Shabab since 2011 in support of Somalia's government. Daphne Eviatar, the director of the Security with Human Rights program at Amnesty International USA, Friday said, "AFRICOM's acknowledgement of civilian casualties is an important step forward from their previous denials of any civilian deaths or injuries from U.S. airstrikes in Somalia."